Although the rate of new Ebola infections has slowed in some areas, the World Health Organization says it would be premature to read that as a success. New WHO projections suggest there could be between 5,000 and 10,000 new cases a week by December. The head of the United Nations Mission for Ebola Emergency Response told the U.N. Security Council that the steps implemented by the international community are not enough to halt the advance of the fatal disease. “This is an international humanitarian and health crisis,” says Lawrence Gostin, university professor and faculty director at the O’Neill Institute for National and Global Health Law at Georgetown University. Gostin says privatized healthcare has undermined the U.S. response to Ebola, with a lack of available vaccines and access to proper care. “Much of our innovation is driven by the private sector, and from their point of view, Ebola was not a predictable disease and those who got Ebola were too poor to pay for it.” We are also joined by Karen Higgins, co-president of National Nurses United. JUAN GONZÁLEZ: Although the rate of new Ebola infections in some areas has slowed down, the World Health Organization said Tuesday it would be premature to read that as a success and that projections suggest there may be between 5,000 and 10,000 new cases a week by December. This is WHO Assistant Director-General Bruce Aylward speaking. DR. BRUCE AYLWARD: We anticipate the number of cases occurring per week by that time is going to be somewhere between 5,000 and 10,000 a week; you know, it could be higher, could be lower, you know, but that it’s going to be somewhere in that ballpark. And the goal now is taking all the different pieces of the response that are planned, everything from the Ebola treatment centers to the people deployments to the community engagements, and trying to make sure we’ve got that capacity in place by that time, so that we can ensure 70 percent of cases can be properly managed or isolated, and 70 percent of burials can be done safely by then. AMY GOODMAN: For more, we’re joined in Washington, D.C., by Lawrence Gostin, university professor and faculty director at the O’Neill Institute for National and Global Health Law at Georgetown University, director of the World Health Organization Collaborating Center on Public Health Law. Still with us in Boston, Karen Higgins, co-president of the National Nurses United. Professor Gostin, thanks so much for being with us. Talk about the global scene right now and also what’s happening in the United States, though it seems we are paying much more attention to the global scene because of what’s happening in the United States. LAWRENCE GOSTIN: Yeah, we are. I mean, I think we have to really remember that the main tragedy is going on in West Africa, and it was an avoidable tragedy, it’s a humanitarian disaster. Just think about what the World Health Organization said. It aspires to handle in a rudimentary way 70 percent of cases. That’s its top level. And that’s just unacceptable. We’re now well over a half a year into this epidemic, well over a half a year, almost coming to nearly a year if you go back to the first index case, and the international community is now only mobilizing. Now, I appreciate everything the United States has done, and they’ve stepped up. President Obama sent military assets in. I think the rest of the world needs to do more. But nonetheless, we have just let this spin out of control in a horrible crisis, a tragedy, really, and are only now mobilizing it when it’s on our front doorstep. We’re better than that. I think we need to do better. And so, I would really like to see us—if we want to be safe here in the United States, we have to attack this at its source in West Africa, and we need to try to get that epidemic under control, first and foremost. JUAN GONZÁLEZ: And, Professor Gostin, about that response, there’s been all the publicity now about the U.S. troops being sent to West Africa to build some treatment centers, but none of those are actually yet operational, and they’re only talking about maybe 1,700 total bed capacity in the treatment centers they expect to build over the next few months. Do you think it’s time maybe to actually just dispatch major ships to be offshore of these African countries and be able to handle a greater volume of patients as they get stricken? LAWRENCE GOSTIN: I do. And, you know, you have to remember that only for the second time in the history of the United Nations, the U.N. Security Council called a health threat—AIDS was the first, Ebola is the second—a threat to international peace and security. So you have a U.N. Security Council mandate for all countries in the world, with the United States, should be the European Union, Australia, Canada, all of our allies. This is an international humanitarian and health crisis. It threatens the stability of the region politically, economically, and, of course, human health matters most. And yes, so we should be mobilizing much, much more. We should have done it earlier. We should do it now. 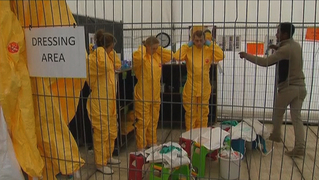 AMY GOODMAN: Professor Gostin, you’re a specialist in quarantine and issues like that. What do you think about the discussions now, the airports that are setting up to see if people have temperatures? I was just listening to Congressmember Sessions of Texas, who was saying he wants to stop all flights coming in from West Africa from the affected countries, letting U.S. citizens come in, but not anyone else. LAWRENCE GOSTIN: Yeah, I mean, that is such a bad idea. And in many ways, it’s very mean-spirited. First of all, it won’t make the United States safer; it will actually make us less safe. Here’s why. First of all, if you cut flights, it means that aid workers will find it very difficult getting to and from the affected region. And the countries themselves will experience economic hardship, commercial hardship. Food prices will go up. And ultimately, I think, the epidemic will spin further out of control. It will make these countries more at risk. And the higher the reservoir of infection in West Africa, the greater the risk we have here in the United States, in Canada, the European Union. That’s just basic math. If you have a lot of people infected in a part of the world, and we live in a modern, globalized world, you can’t put a cellophane wrapper around a whole region and expect to keep germs out. It doesn’t work that way. And so, we think we’re trying to save ourselves, but actually we’re making ourselves at greater risk, and we’re also doing something that’s deeply against the American spirit, which is exacerbating the hardships of people that are undergoing unbelievable suffering at the moment. And I just think we’re better than that. And what I hate about this is, is that health is not a Democrat and Republican issue. It’s not party politics. We don’t play games with this. What we do is we send all of our assets that are available to help bring this under control. If we do that, it will help us at home. I also want to say something about infection control, because we’ve been talking about—there are two lessons I think we can learn. The first is, is that health workers are always on the front lines of the greatest risk. We knew that with SARS. With SARS, it was all the health workers who were at the greatest risk, and now that’s happening with Ebola. And it’s not just here in the United States. In West Africa, they’ve lost several hundred doctors and nurses, and they can ill afford to do that, from Ebola. And the other lesson that we’ve learned is, we can do this—not only in Atlanta and other places in the United States, but Doctors Without Borders, who are operating in horrendous conditions on the ground in West Africa, haven’t had any infections there. So if you have really good equipment, really good training, and you only put your very best-trained people at work with a systems approach and clear protocols, there is no reason for any health worker to become ill.
LAWRENCE GOSTIN: And it’s unacceptable that they should. JUAN GONZÁLEZ: I’d like to bring Karen Higgins back into the conversation, co-president of National Nurses United. I wanted specifically to ask you about the role of the CDC in this crisis. The executive director of your union, RoseAnn DeMoro, at yesterday’s press conference, specifically raised the fact that the CDC has no control over these individual hospitals, that in the privatized hospital system that we operate in here in the United States, the CDC can only offer guidelines, and it’s up to individual hospitals whether they’re going to enforce those guidelines, practice those guidelines. And, in fact, the CDC said yesterday, after your press conference, that they have no plans to investigate what happened at Texas Health Presbyterian, that that’s the responsibility of the local Department of Health in Texas. KAREN HIGGINS: I think, you know—unfortunately, I think she’s right, as far as what powers the CDC has. But the actual interesting part is that when you are looking up any type of—you know, what you do for infections, the place that is always looked to and always looked at is what CDC recommends. And what happens is then CDC makes recommendations, guidelines, and then it falls apart, because what you do with it as an individual hospital, because every hospital is pretty much individual, is where it starts to fall apart. And that’s why we’re saying, what CDC—if everybody is looking to CDC for direction, they need to come up not just with guidelines, but with an actual standard of care, like I said, that everybody will be following, that is expected. And then the follow-up should be with the public health departments in the states to make sure that these hospitals in fact are doing this. And again, putting the teaching in place has to be a huge part of this. AMY GOODMAN: One of the ways you learn about how we go from here is for hospitals to admit what they have done wrong. And, Juan, if you could describe the conference call you were on yesterday, who was on the conference call and listening, but not speaking? KAREN HIGGINS: You know what? I know that there—I’m sorry. AMY GOODMAN: —the workers who wanted to protect themselves. AMY GOODMAN: So they listened, and they emailed their responses to the union? JUAN GONZÁLEZ: Yes, Karen Higgins? KAREN HIGGINS: No, I was going to say, and that is so true. I mean, you know, this hospital has been saying from day one that the protocols were there and everything was good, the protocols were there, they were fine. And I think, you know, to be honest—and then to have the nurses come out and the healthcare workers come out and say, “Oh, no, it wasn’t. No, it was not. This was a lot of, you know, changing of information, not enough equipment, not the right equipment”—you know, I think they’re absolutely right, that they—you know, their fear of being retaliated, because they have come out when the hospital continues to say. And this is the problem. They all continue to say they’re ready. We don’t need another Dallas in another state if another patient shows up. AMY GOODMAN: —now the NIH says they are developing a vaccine. It sounds like this has been possible for a long time, but private corporations—and which this is usually their purview—they knew there wasn’t a lot to be made in this profit-wise. So, this is why there were so few shots available, whether it’s a vaccine or other drugs. Can you talk about the importance of public health, and are vaccines possible in dealing with Ebola? LAWRENCE GOSTIN: Yeah, I mean, the problem is, is that most of our innovation is driven by the private sector. And from their point of view, Ebola was not a predictable disease, and those who got Ebola were too poor to pay for it, and so there’s been a lack of investment. Not only were there not enough doses of ZMapp and things, but they weren’t even tested. There are only now vaccines and others going through clinical testing. And so, we really just don’t have those things on the ground. Just want to make a very quick comment, if I can, about—we call ourselves the most advanced health system in the world, but what do we mean by that? I think what we mean by that is, is that we have the best of the best of the world. But we also have a highly variable system—so many different hospitals, so many different emergency rooms. We have over 3,500 local health authorities. Everybody is—we’ve got such different standards about what we can do. And what we need to do, as Karen says, is up our game. We need to be more uniform, and we need to have systems in place and the kind of equipment and training at every institution, so that this doesn’t happen again. It’s really unacceptable. AMY GOODMAN: Cuba answering the call by sending 165 health workers to hard-hit Sierra Leone, a disproportionately large number for a tiny island nation of 11 million people. AMY GOODMAN: Is Cuba an example for the United States, Dr. Gostin? LAWRENCE GOSTIN: Well, you know, Cuba is—always sends a lot of health workers to humanitarian crises. And I think it is—we need to do much more of that ourselves. But I have to say this: We are—we have sent our military in when very few others have. I think we need to do a heck of a lot more, but the rest of the world needs to do more. I mean, they have just been sitting back and letting this epidemic get out of control, even after the U.N. Security Council. I would venture to say that I would like the U.N. Security Council to come back and pass a binding resolution that would actually set markers for the kinds of resources that are needed to bring this under control. And I think if we do that, we’ll really show a seriousness of purpose. And I think we can do this. AMY GOODMAN: Professor Larry Gostin, thanks so much for being with us, faculty director at the O’Neill Institute for National and Global Health Law at Georgetown University. We’ll link to details on our website about the National Nurses United conference call today at 3:00 p.m. As Juan pointed out, thousands of nurses have signed up for this conference call from around the country. And, Nurse Higgins, we want to thank you for being with us, Karen Higgins, co-president of the National Nurses United, who works as an intensive care unit nurse in Boston, where she was speaking to us from. When we come back, we go to Mexico. What’s happened to these scores of students who we have not seen for weeks after a police ambush? Stay with us. Mexico’s Missing Students: Were 43 Attacked by Cartel-Linked Police Targeted for Their Activism? NEXTMexico’s Missing Students: Were 43 Attacked by Cartel-Linked Police Targeted for Their Activism?